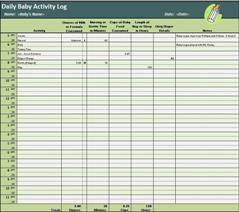 Use our FREE Daily Baby Activity Log to record your baby's feedings, diaper changes, naps, and other routine activities. This log will also allow you to track your nursing schedule (left versus right,) and help you determine how frequently you diaper your baby. Using this log will help you to create a set routine for your baby. Babies do well when they follow a standard schedule. You can also provide a copy of a completed log to your baby's caretaker so she/he better understands your baby's needs.